Thomas Edison and Alexander Graham Bell formed the Oriental Telephone Company, the first telephone company. F. Kaiser discovered asteroid #778 Theobalda; and G. Neujmin discovered asteroids #779 Nina, #780 Armenia and #781 Kartvelia. Transcontinental telephone service was inaugurated in the US when Alexander Graham Bell called Thomas Watson in San Francisco from New York City. K. Reinmuth discovered asteroids #1250 Galanthus and #1251 Hedera. Columbia University scientists developed an atomic clock accurate to within one second in 300 years. The first scheduled US transcontinental commercial jet flight was made by American Airlines, using a Boeing 707. Tickets for the Los Angles to New York City flight cost $301. NASA launched the Echo 2 communications satellite from Vandenberg AFB, California, on a thrust augmented Thor-Agena B. A. D. Andrews discovered asteroid #1727 Mette. The joint NASA/British/Dutch infrared telescope satellite IRAS was launched into polar orbit from Vandenburg AFB, California. 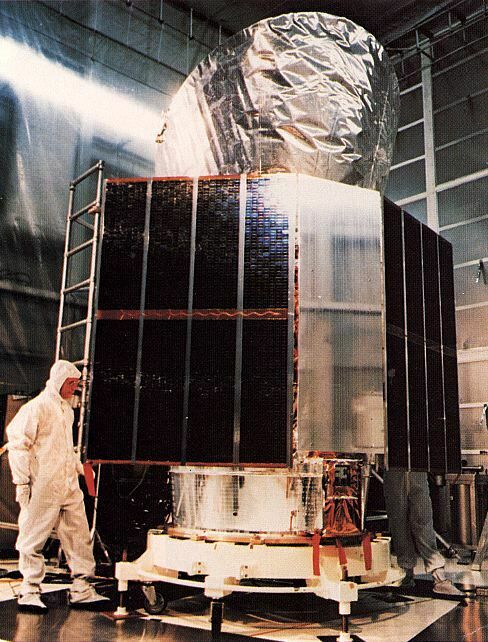 The Infrared Astronomical Satellite (IRAS) was a joint mission by the United States (NASA), the Netherlands, and the United Kingdom, launched 25 January 1983. The basic goal was to obtain a full-sky survey over the approximate wavelength range 8 to 120 micrometers with four broadband photometry channels. The satellite was a spacecraft with a telescope mounted in a liquid helium cooled cryostat. The telescope was a f/9.6 Ritchey-Chretien design with a 5.5 m focal length and a 0.57 m aperture. The mirrors were made of beryllium and cooled to approximately 4 K.
The focal plane assembly contained the survey detectors, visible star sensors for position reconstruction, a Low Resolution Spectrometer (LRS) and a Chopped Photometric Channel (CPC). The focal plane assembly was located at the Cassegrain focus of the telescope and was cooled to about 3 K.
An array of 62 detectors was used to detect the infrared flux in bands centered at 12, 25, 60, and 100 micrometers. The noise equivalent flux densities were, respectively, 0.1, 0.1, 0.1, and 0.3 Jy (1 Jansky = 1E-26 W/sq m-Hz) in the four survey bands. The positions of galactic and extragalactic sources were determined to an accuracy of 0.5 arc-min. In addition to the focal-plane detector array used for the all-sky survey, a low-resolution spectrometer and a 60-and 100-micrometer chopped photometric channel were included on IRAS. To scan the sky for the survey, the satellite was rotated at a constant angular velocity perpendicular to the satellite-sun vector. IRAS could also be pointed at a selected celestial object for up to 12 minutes, to permit observations of selected objects with an increase in sensitivity or spatial resolution up to ten times that of the general survey. From 9 February 1983 to 22 November 1983, IRAS conducted a survey of the sky at thermal infrared wavelengths from a 900 km polar orbit about the Earth. This survey consisted of 5749 scans along lines of constant solar elongation, between 60 and 120 degrees solar elongation. 95% of the sky was covered twice and 72% was covered three times by IRAS. In addition to detailed observations of the zodiacal cloud, IRAS also made over 8000 detections of asteroids. Further discussion of the IRAS mission can be found in G. Neugebauer et. al., Science, v. 224, pp. 14-21, 1984, and in the entire 1 March 1984 issue of Astrophysical Journal Letters (v. 278, pp. L1-L85). E. W. Elst discovered asteroid #3631 Sigyn. The Hubble space telescope Field Optics Camera captured images of NGC3862/3C264, an extragalactic jet powered by a supermassive black hole at the center of a galaxy 260 million lightyears from Earth. The US space probe Clementine was launched toward the Moon and asteroid 1620 Geographos. 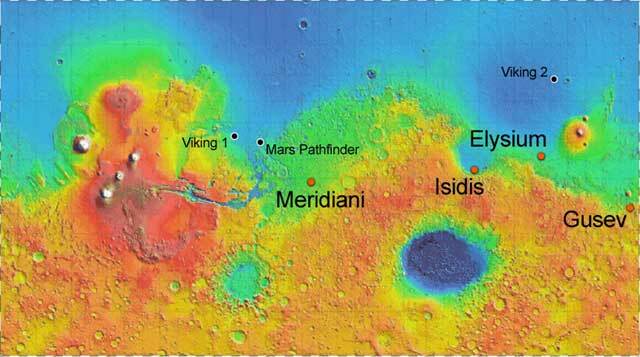 NASA's Mars Exploration Rover "Opportunity" (MER-B) landed at Terra Meridiani on Mars. "Opportunity" (Mars Exploration Rover B) is one of the two rovers NASA launched to Mars in mid-2003. The rovers arrived at Mars in January 2004 equipped with a battery of scientific instruments, able to traverse 100 meters a day. The nominal plan called for the missions to last for 90 days, until April 2004. Over a year of surface operations, involving driving the rover, imaging, and use of the science instruments had already been achieved in 2005, and the rovers had their missions extended to at least November 2006 if they could continue to operate. Opportunity was still operating until 12 June 2018 when a dust storm forced it to hibernation, performing useful science experiments with a total accumulated driving distance surpassing that of a marathon in February 2015. In January 2019, there was some hope high winds would clear the rover's solar panels and it could resume operations. The scientific goals of the rover missions were to gather data to help determine if life ever arose on Mars, characterize the climate of Mars, characterize the geology of Mars, and prepare for human exploration of Mars. To achieve these goals, seven science objectives were called for: 1) search for and characterize a variety of rocks and soils that hold clues to past water activity, 2) determine the distribution and composition of minerals, rocks, and soils surrounding the landing sites, 3) determine what geologic processes have shaped the local terrain and influenced the chemistry 4) perform "ground truth" of surface observations made by Mars orbiter instruments, 5) search for iron-bearing minerals, identify and quantify relative amounts of specific mineral types that contain water or were formed in water, 6) characterize the mineralogy and textures of rocks and soils and determine the processes that created them, and 7) search for geological clues to the environmental conditions that existed when liquid water was present and assess whether those environments were conducive to life. The Mars Exploration Rovers, Spirit and Opportunity, were named through a competition sponsored by The Planetary Society and the LEGO Company. Opportunity was launched on a heavy Delta II 7925H on 8 July 2003. After insertion into a circular Earth parking orbit, the spacecraft third stage reignited and put the craft on a trajectory to Mars, after which the aeroshell, lander, and rover separated from the third stage. The cruise phase to Mars ended on 11 December 2003, 45 days before Mars entry. The approach phase then lasted until Martian atmospheric entry on 25 January 2004. On entry, the lander and components had a mass of 827 kg and were travelling at 19,300 km/hr. The aeroshell decelerated the lander in the upper Martian atmosphere for about four minutes to a velocity of 1600 km/hr, followed by deployment of a parachute. The parachute slowed the spacecraft to about 300 km/hr. A series of tones transmitted by the spacecraft during entry and after landing indicated the successful completion of each phase. Just prior to impact, at an altitude of about 100 m, retrorockets slowed the descent, and airbags inflated to cushion the impact. The craft hit at roughly 50 km/hr and bounced and rolled along the surface, stopping in a small crater. The airbags deflated and retracted, the petals opened, and the rover deployed its solar arrays. The landing took place at 5:05 UT (Earth received time), approximately 1:15 pm local time, about two and a half hours before Earth set at Terra Meridiani. On Mars, it was the latter half of southern summer. The landing ellipse is centered at 2.07 S, 6.08 W and is roughly 119 by 17 km oriented at 88 degrees. Terra Meridiani is also known as the "Hematite Site" because it displays evidence of coarse-grained hematite, an iron-rich mineral which typically forms in water. It also appears to be one of the smoothest and therefore safest areas for a landing. An egress phase took place over the first 4 days, involving deployment of the Pancam mast and high gain antenna, rover stand up, imaging and calibration, selection of the proper egress path, and finally driving the rover off the lander deck onto the Martian surface. The Mars Exploration Rover consists of a box-like chassis mounted on six wheels, containing a warm electronics box (WEB). On top of the WEB is the triangular rover equipment deck, on which are mounted the Pancam mast assembly, high gain, low gain, and UHF antennas, and a camera calibration target. Attached to the two forward sides of the equipment deck are solar arrays, level with the deck and extending outward, with the appearance of a pair of swept-back wings. Attached to the lower front of the WEB is the instrument deployment device, a long hinged arm which protrudes from the front of the rover. The wheels are attached to a rocker-bogie suspension system. Each wheel has its own motor and the two front and two rear wheels are independently steerable. The rover has a top speed of 5 cm per second, but the average speed over time on flat hard ground would be 1 cm/sec or less, due to the hazard avoidance protocols. The rover is designed to withstand a tilt of 45 degrees without falling over, but is programmed to avoid exceeding tilts of 30 degrees. The warm electronics box houses the computer, batteries, and other electronic components. The box is designed to protect these components and control their temperature. Thermal control is achieved through the use of gold paint, aerogel insulation, heaters, thermostats, and radiators. Power is provided by the solar arrays, generating up to 140 W of power under full Sun conditions, stored in two rechargeable batteries. Communications with Earth are in X-band via the high gain directional dish antenna, and the low gain omni-directional antenna. Communications with orbiting spacecraft are through the UHF antenna. The onboard computer has 128 megabytes of random access memory (RAM), augmented by 256 megabytes of flash memory and smaller amounts of other non-volatile memory, which allows the system to retain data even without power. An inertial measurement unit provides 3-axis position information. The rover carries a suite of instruments for science and navigation. The panoramic camera (Pancam) and navigation cameras are mounted on top of the Pancam mast assembly, about 1.4 meters from the base of the wheels. The mast, mounted at the front of the equipment deck, also acts as a periscope for the Miniature Thermal Emission Spectrometer (Mini-TES). Attached to the end of the instrument deployment device are the Alpha Particle X-Ray Spectrometer (APXS), Mossbauer Spectrometer (MB), Microscopic Imager (MI), and Rock Abrasion Tool (RAT). A magnet array is attached to the front of the equipment deck. Two hazard avoidance cameras are mounted on the front of the rover and two on the rear. The group of science instruments (Pancam, Mini-TES, APXS, MB, MI, and RAT) is known as the Athena science package. For more information, be sure to see the Mars Exploration Rover Mission home page. Eleanor F. "Glo" Helin (19 November 1932 - 25 January 2009) was an American astronomer and the principal investigator of the Near Earth Asteroid Tracking (NEAT) program of NASA's Jet Propulsion Laboratory. She retired in 2002. Helin discovered or co-discovered 872 asteroids and several comets. Asteroid 3267 Glo is named for her ("Glo" was Helin's nickname).